Do you dream of doing great things in God’s Kingdom? Are you ready to go to the next level of intimacy with God, spiritual maturity, and usefulness in ministry? But we all, with unveiled face, beholding as in a mirror the glory of the Lord, are being transformed into the same image from glory to glory, just as by the Spirit of the Lord” (2 Corinthians 3:18). “For in it the righteousness of God is revealed from faith to faith; as it is written, ‘The just shall live by faith'” (Romans 1:17). We’re not called to stagnate. We’re called to be hungry and thirsty for righteousness. We’re called to work out our own salvation with fear and trembling and to walk worthy of the divine calling to which we were called. So if you’re ready for MORE in the Kingdom, what do you do? How do you go about getting promoted to the next level? Some people would tell you that you just have to wait on God. That has some truth to it; we should wait on God in every aspect of our lives. However, “waiting on God” can sometimes be taken out of Biblical context. If you’re hungry for more, you don’t have to just sit back and hope. There are secrets to promotion in God’s Kingdom. There are actual things you can do to accelerate the process of growth and promotion. You have a huge amount of influence in both the manner and timing of your promotion, because only you can decide how ready you will be. 1. Get rid of your idols. Look to God for what you want, not to men. God is not into idols. If you are trying to get your provision, promotion, or maturity from somewhere other than Him, He’s not going to affirm that behavior in you. He’s not going to give you what you want because doing so would teach you that your behavior secured your results. No, He’s going to make sure that He has the place in your heart that He deserves. He’s going to make sure that you are looking to Him, and only to Him, for what you need—including promotion. When you stop clutching at people or circumstances for what you need and place your eyes are on Him alone, He can work with that. So first and foremost, study the Scriptures in this post about where promotion comes from. Meditate on them until you truly get it that promotion comes from God. Wait patiently for God to open doors. If you have ideas and permission to implement them, go ahead; but never manipulate others to get what you want. After you are able to look to God instead of to men for what you need, God will place you into your dream at the right time, in the right place, and in the right way. 2. Develop character that makes you promotable. If the opportunity you desire were offered to you right now, would you be ready? If you were to accept that new opportunity, do you have sufficient character to sustain it successfully? Character matters. It’s the #1 evidence of your relationship with God. However, all too often, we Christians chase after everything but character. The results of our ill-fated pursuits mean that, when we finally get an opportunity we hope will be THE ONE, we are often unable to sustain it. We crash and burn because our shoulders were not wide enough to take on what we attempted to take on. It’s better to be trustworthy than it is to be trusted. It’s better to be deserving of promotion in God’s eyes than it is to actually be promoted. If everything were stripped from you, your hidden life in God’s eyes is the only thing you would have left. Examine yourself. Would your hidden life and character be worth keeping? Hunger and thirst after righteousness that result in a passionate pursuit of God. A faithful, hidden life of prayer, worship, and the study of God’s Word. Clean hands and a pure heart (Psalm 24:3-4). Abandon sin and pursue purity and holiness in your daily life. Develop a servant’s heart. Jesus said the greatest people in the Kingdom are the servants. Serve, serve, and serve some more. Be dependable. Show up where you’re committed to show up, day in and day out. Be accountable. Tear down the walls and take off your mask. Get life-on-life with other people, and let other people get life-on-life with you. Become worthy of promotion. Become the person who can successfully sustain the promotion you desire over decades and decades of service. Building godly character is the only way to go about that. 3. Prepare for the job or ministry you want. No matter what you’re called to, do what you can wherever you are to prepare for that calling. Are you called to preach? If so, set aside time every day to study and write sermons. By the time you get your opportunity, you’ll have notebooks of prepared sermons. Who knows? You may need them quickly! Are you called to lead worship? Write songs and practice your instrument every day. Sing scales every day to strengthen your vocal cords. Spend extra time worshipping God alone. Men may not see you yet, but God will, and you’ll be ready when He chooses you. If you’re headed to the African bush, learn wilderness survival skills. If you’re headed to Brazil, learn Portuguese. If you’ll be teaching music, begin to search for second-hand instruments so you can have tools available for students who can’t afford them. Are you called to disciple children? Spend time now designing fun activities, lesson plans, games, and craft projects that will help children learn what you are called to teach. 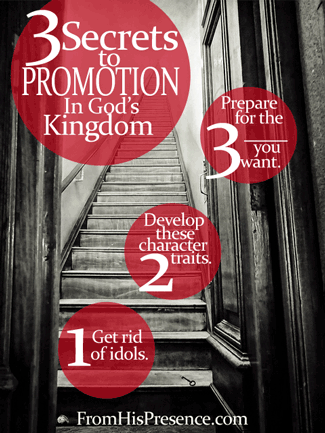 These are the secrets to promotion in God’s Kingdom. Jesus said that many people are called, but few are chosen. The difference between the two groups? The chosen ones, after they receive the initial call, prepare for their call. When opportunity knocks, the chosen ones are ready and can be dispatched into their destiny. We’re all called to go to higher levels with God. Our steps must take us from glory to glory and from faith to faith. By getting rid of our idols, developing godly character, and preparing for our call, we can all experience promotion in God’s Kingdom. Photo courtesy of Jose Maria Perez Nunez via Creative Commons license on Flickr. Great article! So good the parts about character and preparation. We don’t talk much about this anymore, yet it’s so crucial. Our character matters to God. Thank you for posting it. I have shared it with friends and disciples. Thank you, Erin. I agree. Character matters so much, and we need to hear teaching on it once again. It seems to have gone by the wayside, too often replaced by easier teachings about victorious living and prosperity and blessing. All of which are also godly and Biblical, but what about holiness and purity and faithfulness and integrity? May God have mercy and turn our hearts back to Himself in every way. Thank you for reading and for sharing! Have a great day! Wonderful message about being more Christlike in our attitude and thinking. The church should discuss this topic more. Thank you ! Very touching and strenghtened. ” look to God for what you want,not to men”we do look to people for our promotion and again blame others and circumstances if we don’t have it.I will preach this on sunday worship service. God bless you ! I pray the preaching goes well, friend! I am better directed on how to be prepared and ripe for God to exalt me . I am now aware of my roles that facilitates God promotion. God bless you. Because the term “bush” is not used to describe wilderness outside of Africa. Each continent has a separate term for “wilderness.” No offense was intended. Thanks for reading. I am so encouraged by your article thank you for allowing the Lord to lead you.